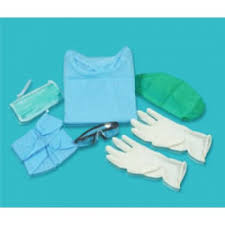 We are manufacture and supply HIV Prevention Kit that consist of OT Gown, Hood Cap, Face Mask, Leg Covers, Eye Protection Glasses, Gloves, etc. These kits are designed and manufactured our skilled professionals using optimum grade basic materials keeping in mind set industry norms. The HIV Prevention Kit is known for hygienic, safe to use and reliable. It is available in different packaging options as per the needs of the clients at reasonable prices. We are one of the prominent manufacturers and suppliers of Disposable HIV Kits. The kits offered by us are designed and manufactured by the professionals in compliance with the international medical standards. These kits are widely used to get protection from HIV infected patients during treatment. Before the final dispatch, all our products are thoroughly checked by the quality professionals of our firm to ensure their flawlessness. 2. 1 No full length impervious double laminated protective gown. 3. 1 pair heavy duty shoe cover overall with gripper attachment. 4. 2 Nos heavy duty drape sheets with gripper attachment for patient undercovering. 5. 1 No high protective moulded goggles, 3 layer filtered face mask and surgeon cap. All items are sterilised by ETO. Looking for HIV Kit Disposable ?